My name is Avery, (I'm a girl), I just turned 13, and I recently discovered a big passion for ballet. I have a great local company, Ballet Austin that I take a beginners workshop at once a week. I'm 4 weeks into it and I've been learning a lot! We're covering mostly barre work but I feel like it's been really helpful. The next workshop is learning turns and I think I'm going to take it next. I don't have very good turnout, I'm gaining my flexibility back, but I have a lot of tenacity. I've really developed a passion for ballet. I feel beautiful in ballet. I love every part of it and would like to keep pursuing it. A career would be ideal but I know my first step is getting into the academy. I have a few friends at school who are in high levels at the same academy. Right now I'd be in level one. It's a little hurtful to my self-esteem but if that's what it would take I'd take that opportunity in a heart beat. My plan is to take as many workshops and classes as I can so I can audition for the academy at a higher level so I can catch up faster. I know once you turn 14 it's extremely competitive. I know there have been a few dancers who started at 13 but I don't know any who made it to classical ballet. All I want to know is what I should do to get caught up, to have a chance. I feel like things are pretty slow right now. My friends are trying to graduate early and their both going to SAB on full scholarship for five weeks this summer while I'm trying to break into the academy. I know I shouldn't focus on them but it's kind of hard not to. I heard that you started late and I was hoping to reach out to you with the same dilemma. Any advice would help at this point. To:- Career Development Plan- How to catch up in ballet? Thank you so much for taking the time to contact me, it is really great to hear from you. I enjoy keeping in touch with young dancers like yourself to help you along to reach your goals in ballet. aged 8, having previously studied gymnastics. I suppose that age could be considered 'older' to start dancing, but I went away to a vocational ballet school by aged 11 to train in ballet seriously, so I tend to think about myself as starting ballet at an early age compared to other dancers I know in the profession. In fact, a lot of my friends who are professional ballet dancers I work with now only began training seriously at a much later age. By aged 16, most of them had moved to a vocational dance school but beforehand trained more locally at a dance school. Most of my friends who began training with me at aged 11 are actually no longer dancing now. I am telling you this, so you see it isn't always a must to start early on. Of course, if you have the potential for ballet, it certainly helps starting as young as possible, but often your ability can develop at a later age in your teens which is when your real abilities can come out. My advice to you is accept it will take time to see a difference with your improvement in ballet. You must be patient but persistent and do your work outside of the classes too. This can be as little as remembering your corrections or reflecting on your goals for your next class, but it is this sort of preparation which helps you progress quicker. Unfortunately, there is no magic to suddenly transform you into a ballerina but there is hard work! If you are a hard worker, it pays off, so keep focused on what you want. Make sure you really use every second in your classes to listen to your teachers, absorb the corrections and ask questions if you need. Think of yourself like super-girl! You can fuel yourself with energy even if you feel tired, so you really make the most of your classes to improve. I hope these small tips help you for now, but please keep in touch. I'm interested by your story and I'd love to guide you along the way! 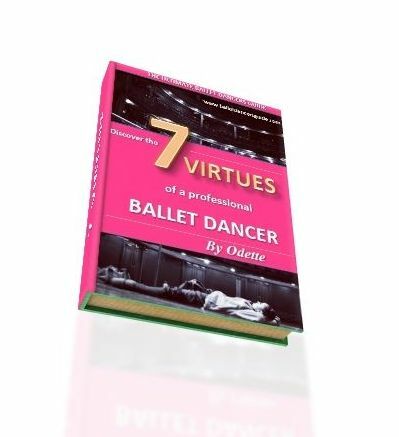 Please make sure you look at my eBook "7 Virtues of a Professional Dancer". I wrote this book especially for young passionate dancers in your situation, who need an answer now sooner rather than later to reach your goals. My guidance will give you the opportunity to grow and help you believe you already have the skill and knowledge inside you to unleash your talents in ballet. If you would like a free guide first, you are welcome to my Seven Secrets ..... which will help you become the best dancer you can be. Just at my 'Seven Secrets of Ballet' page.